← Year of the Black Snake! We have recently acquired Kicking Mao’s Book across Tiananmen : [After Rainer Ganahl] 1 Day Before the Massacre Anniversary, a darkly playful artist’s book by the ICP’s own Haley Bueschlen. Haley, who grew up in Beijing as an American citizen, endeavors to dismantle systems of power between the US and China through photography, video and performance. 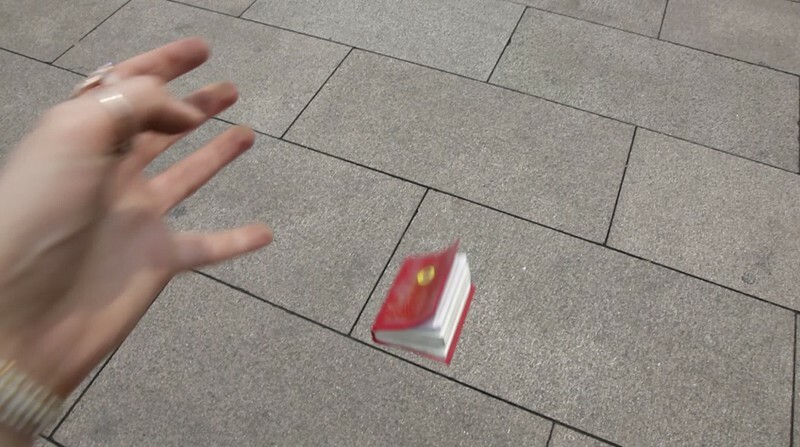 Kicking Mao’s Book Across Tiananmen Square (2012) from Haley Bueschlen on Vimeo. Kicking Mao’s Book across Tiananmen is a compilation of video stills which explores how the narrative of Tiananmen Square has changing from tragedy to tourism. Haley kicks Mao’s book across Tiananmen Square with no response, outlining how the government’s concerns have moved from away street protesting to internet censorship. This entry was posted in artists' books, New Acquisitions and tagged Haley Bueschlen, Kicking Mao's Book across Tiananmen, Kicking Mao's Book across Tiananmen : [After Rainer Ganahl] 1 Day Before the Massacre Anniversary, Liz Sales, Tiananmen Square. Bookmark the permalink.